The NOAA Office of Ocean Exploration and Research has a bunch of great photos and videos from a recent expedition to American Samoa. 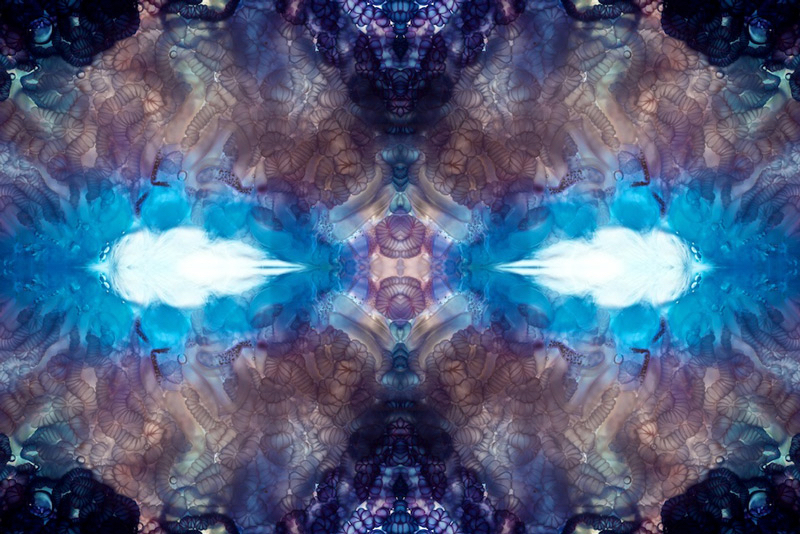 Photo above is the Cosmic Jellyfish. 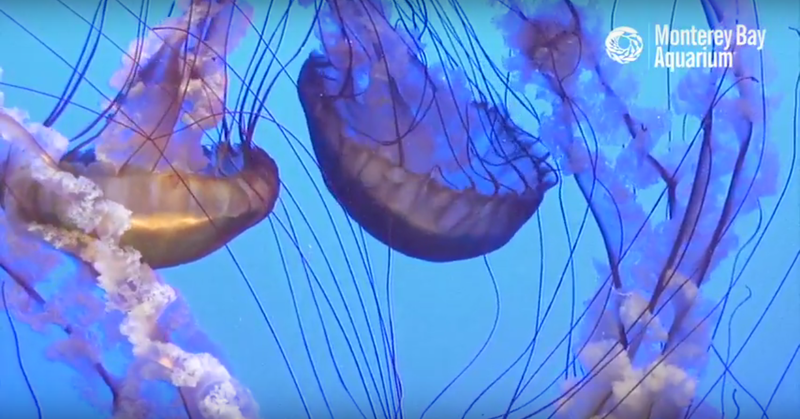 In this video, you can see the perfectly relaxed arrangement of the two sets of tentacles; scientists think this is a position that allows for optimum feeding in the midwater environment at ~3,000 meters. Through remotely operated vehicle video observations such as this, we can learn much about the animals in the midwater and what they are up to when we can catch them in an undisturbed manner. 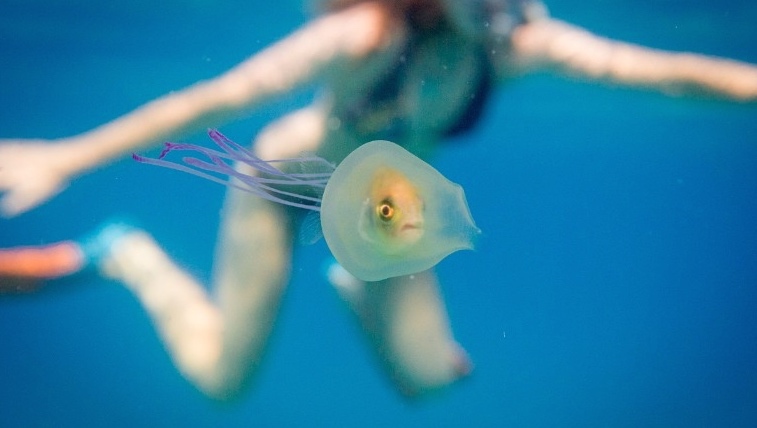 Ocean photographer Tim Samuel captured these startling photos of a fish swallowed by a jellyfish off Byron Bay, Australia's Pass Beach. "(The fish) seemed to be struggling a little bit, as it would swim around, it would try to swim in a straight line but the jellyfish would knock it off course, would send it in little circles or loops," Samuel told CNN. "It was a tough decision, I definitely thought about setting it free, but in the end decided to just let nature run its course." No, you're not tripping. And these aren't CG. You're looking at Portuguese man-of-war jellyfish captured by Florida-based photographer Aaron Ansavor who finds them on a local beach. "It's an opportunity to explore a new world," he told National Geographic. Steve Haddock of the the Monterey Bay Aquarium Research Institute (and author of the fantastic book, Practical Computing for Biologists) sent me a link to MBARI's latest video, about the wonderfully weird Velella jellyfish, aka the by-the-wind sailor. In the spring, beaches can be covered by thousands or even millions of blue jellyfish relatives called Velella velella, the by-the-wind sailors. Velella typically live on the surface of the open ocean far from shore, propelled by winds pushing on their tiny sails. Velella is best described as a hydroid colony which has flipped itself over. 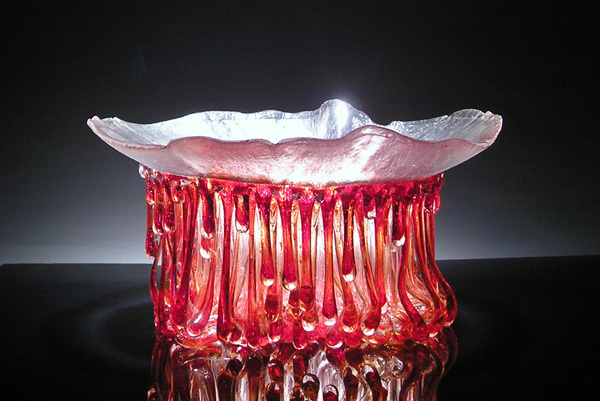 It is unlike a traditional jellyfish (medusa), but rather like the benthic stage of a hydroid. Instead of living attached to rocks on the bottom, its "substrate" is the ocean's surface. These hydroid colonies bud off tiny medusae, little "jellyfish", just like many benthic hydroids do. A particularly striking feature of Velella is their blue pigmentation. In fact, most animals that live on the surface of the water (snails, jellies, fish) have blue pigmentation. It may serve different purposes for different organisms, but is likely a combination of camouflage and protection from the sun's rays. 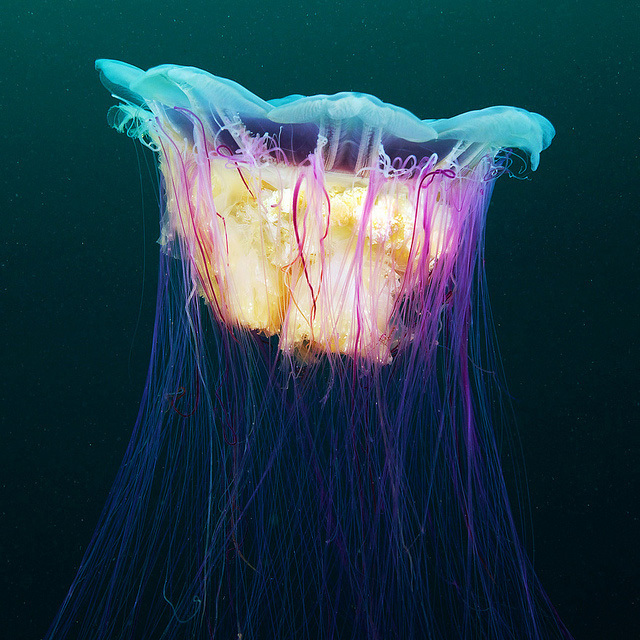 Alexander Semenov's lovely photos make jellyfish look completely amazing—masses of ethereal tissue surrounded by thousands of strands of iridescent embroidery floss. This shot is part of a series of photos taken in the deep, dark, cold waters of the Arctic Circle. A couple of days ago, Rob told you about scientists who had built a "jellyfish" in the lab, using rat cells. Which is awesome. Naturally, it's not quite as awesome as it sounds, though. The scientists haven't created life. Instead, they've built a little construct of cells and silicone. 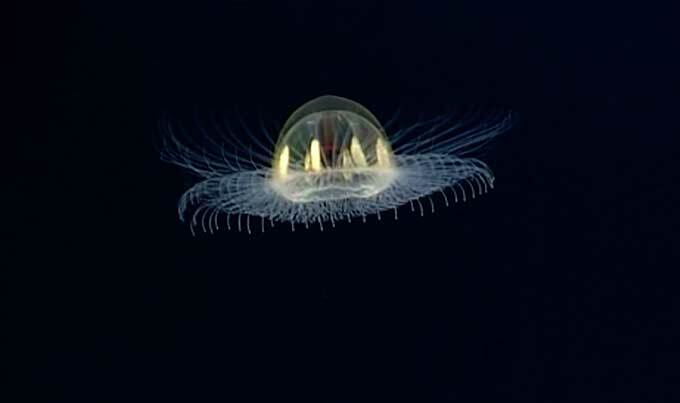 This construct—the medusoid—is interesting, in that, when you spark it with electricity, it moves in ways that are very similar to a juvenile jellyfish. But it's not actually an animal. It doesn't eat. It can't make more of itself. It needs that outside zap to move at all. But despite all that it is not, the medusoid is a very cool first step towards doing some amazing things. 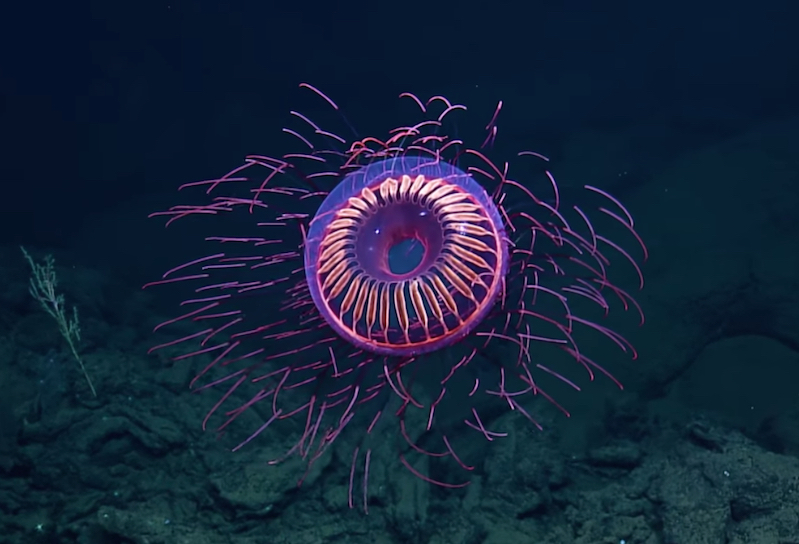 At Scientific American, journalist Ferris Jabr looked at what the scientists have done, how living jellyfish work, and what it would take to build a for-real-real artificial jellyfish. 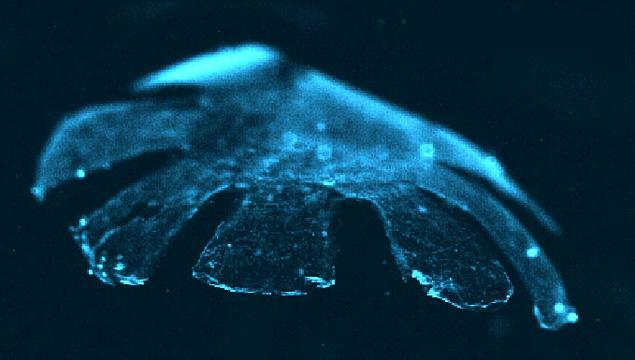 Whereas a real jellyfish generates electrical impulses to stimulate its muscle cells, a medusoid is entirely dependent on voltage generated by electrodes in its tank. Moon jellies have eight pacemaker cells scattered around the middle of their bodies (just about every jellyfish body part comes in multiples of four). 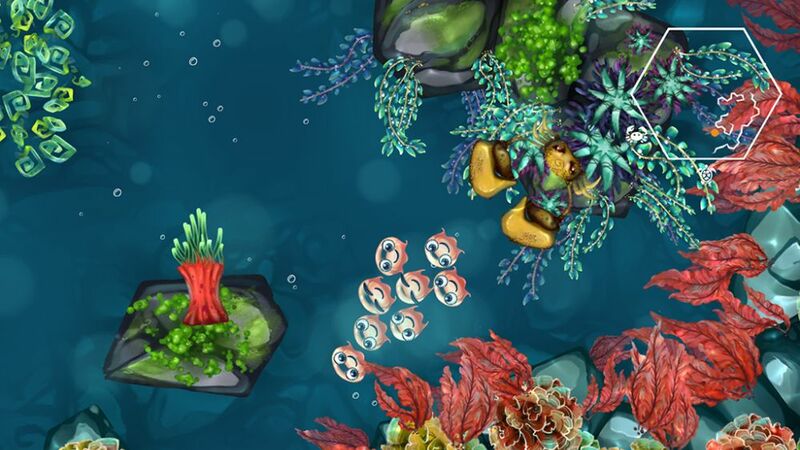 Pacemaker cells keep the jellies’ muscles pulsating rhythmically. We have pacemaker cells in our hearts that do the same thing. So do rats. Janna Nawroth thinks it’s possible to weave pacemaker cells from a rat’s heart into the heart muscle tissue that makes up a medusoid, which might allow the artificial jellyfish to bob on its own, sans electrodes. [Video Link] Steve Haddock, a research scientist at the Monterey Bay Aquarium Research Institute (as well as a MAKE contributor, and co-author of a great book called Practical Computing for Biologists) just posted this video about a weird and wonderful jelly called the scyphomedusa Deepstaria.